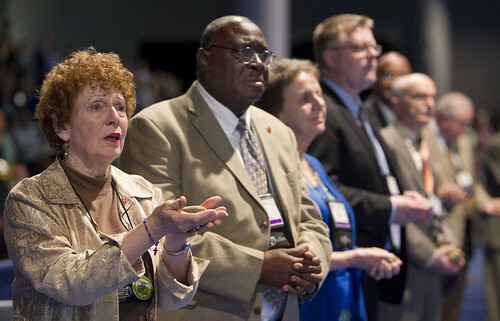 Methodist General Conference in Tampa, Fla. A UMNS photo by Mike DuBose. The United Methodist Church through 2012 General Conference has pledged to work with Cheyenne and Arapaho Tribes in seeking belated justice for an 1864 massacre of 168 defenseless Native Americans in which Methodist leaders in Colorado were complicit. The adopted resolution authorizes an independent group to "provide full disclosure" of the involvement of Methodists in the Sand Creek Massacre. The local Union army troops who destroyed a Cheyenne and Arapaho village were led by Col. John M. Chivington, a Methodist clergyman, and approved by John Evans, the Colorado territorial governor, who was a prominent Methodist layman. Chivington was not punished or censured by the church. Another action provides for widespread denominational education, repentance and confession regarding past treatment of indigenous people. It asks every congregation to "demonstrate a genuine attitude of repentance." General Conference put the organization of the Sand Creek study in the hands of the denomination's Council of Bishops and its agency on history and archives. A report will be taken to the 2016 General Conference, which meets every four years to conduct church business. The action recognized four tribes as representing the Sand Creek cause and said the church will work with them in regard to reparations, repatriation, and research related to the massacre. The four tribes are the Northern Cheyenne of Montana, the Cheyenne and Arapaho Tribes of Oklahoma and the Northern Arapaho of Wyoming. Three nights earlier, the 2012 General Conference took part in an "Act of Repentance" for past abuse of native and indigenous people, with a special emphasis on Sand Creek. On May 1, this was followed by approval of the resolution, opening a process of confession and healing with regard to relations with indigenous peoples. The almost 1,000 delegates also said that The United Methodist Church will support and take part in efforts to return to the tribes any artifacts related to Sand Creek. A memorial to the victims and a study center was built in Colorado by the National Park Service several years ago. The United Methodist Church contributed $50,000 to the building of that center. There was no floor debate on the Sand Creek measure, which passed by a large majority on a show of hands. *Wright is an information consultant working with the Board of Global Ministries.